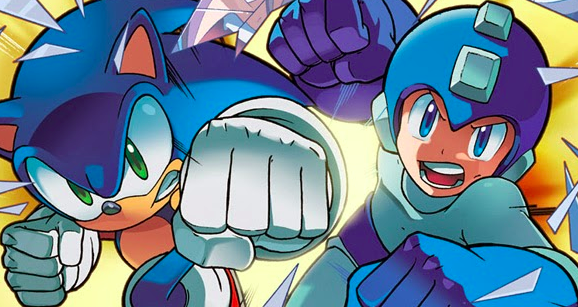 If Amazon is to be believed, Archie Comics are set to collect the complete Sonic and Mega Man crossover, Worlds Collide, in a single hardback volume. "Sonic/Mega Man Worlds Collide: Deluxe Edition" is a 336-page book due on November 25th, 2014 for $46.76 US. That's just about enough pages to collect all three individual Worlds Collide trade paperbacks! Further, Amazon lists a limited edition version for $73.54 US. Pending official word from Archie, however, we can only speculate what makes this so "limited." Foil dust jacket? Additional pages of concept art? Who knows. So if you've been meaning to check out the crossover, this may be the way to go. More news as it comes. They are crazy!!! $73.54 for just an art comic books ?! What a piece of junk. I would buy new Mega Man game instead! What a ridiculous price! You mean a limited edition which is generally just extra fan service. And considering this was a pretty big occasion, I wouldn't be surprised if it included sketches or outlines of panels from the comics or notes from those that worked on it. Also is that all you do now, insult any product that isn't a game that other fans may enjoy and keep asking for a game? Because it's getting older than Prof insulting the comics. Did you just completely overlook the regular price of $46.76 which is a fair price for 336 pages? Huh. Just in time for Christmas. Sweet. C: Thanks for the tip, Protodude! In addition to being more expensive than buying the three trades individually it has less pages somehow. But no we're not allowed to complain about it. Er... since when is 336 pages less than 312 pages? You do realize that it's probably going to contain new stuff nobody has seen yet, right? Have a little faith and stop whining prematurely. The comics themselves run about 20 pages. Times 12, that's about 240 pages, just to tell the actual Worlds Collide story. We've got nearly 100 more pages of content for covers, art, notes, etc. And it's hardback, which is always more expensive than paperback. Sounds completely reasonable to me.